Is there a nonsweetened "baker's chocolate" version of white chocolate out there? 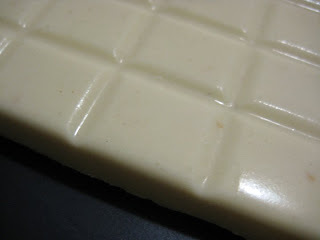 I love the flavor of white chocolate, especially with vanilla bean seeds, but NOT the overdone sweetness. Is there a "baker's chocolate" version of white chocolate - completely unsweetened - out there? Judging by the ingredient lists on a lot of commercial white chocolates, the equivalent is...cocoa butter. (?) Is that right? Would love to have the flavor and saturated fat content without the sugar, maybe for experimenting with sauces, reductions, and occasional dessert applications. that seriously looks like a someone took a picture of the edge of their tile kitchen counter top. Awesome! Thanks for this tip on this very well done recipe/explanation. I'm a little bit afraid of this probability that my white chocolate affection stems solely from the sugar content. Guess I would have to gamble on a purchase of food grade cocoa butter to see. I know of Artisana-- and there are a few other Raw food companies that carry bigger bags-- keep in mind it is quite expensive. Any food-grade brands of cacao butter that you'd recommend? white chocolate IS just cocoa butter, with some sweetener added. It isn't chocolate. your other commenters offering links to raw cocoa butter are on the money. You will have to do something to it, on its own it is not always pleasant tasting.